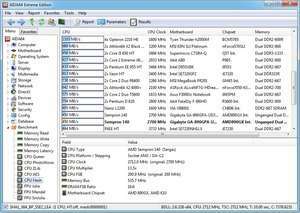 AIDA64 is the successor of the popular Everest tool and is a system and hardware diagnostic tool for virtually every edition of Windows. Inside the user interface of AIDA64, users can view upto 50 different pages of system information -- it's that comprehensive. It includes hardware components, CPU and memory information and details about software. Customizing and exporting the information provided by AIDA64 is simple; you can export to various different formats for use in external programs like Excel. AIDA64 5.99.4900 is a shareware program and can be used as a demo to try the software until the free trial period has ended. A full version of the program is available after the trial period ends. For security reasons, you should also check out the AIDA64 download at LO4D.com which includes virus and malware tests. Additional screenshots of this application download may be available, too. AIDA64 download been highly rated by our users.